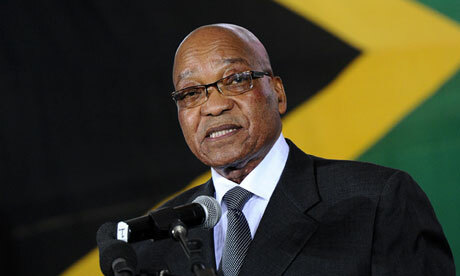 Opposition parties have accused President Jacob Zuma of being at the centre of one of the biggest corruption scandals in democratic SouthAfrica, after reports that millions of rand of taxpayers’ money were spent on a swimming pool and other facilities at his private home. Zuma was accused of deceiving parliament about the expense and scope of the security upgrade to his residence in a scathing draft report by the country’s anti-graft watchdog, entitled ‘Opulence on a Grand Scale’, that was leaked to the Mail & Guardian newspaper. Opposition parties said that, if the findings are upheld in the final report, the president should face a parliamentary investigation with the potential to lead to his impeachment. 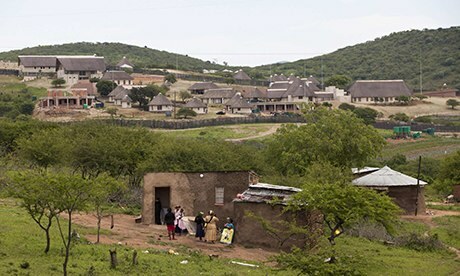 The scandal over state-sponsored construction at Zuma’s private residence in Nkandla, a modest rural town in KwaZulu-Natal province, has been rumbling since a December 2009 article in the Mail & Guardian about a 65m rand (£3.9m) “splurge” there. The cost soared in the intervening years to 215m rand, with a further 31m rand in works outstanding, triggering intense media scrutiny and public condemnation, as well as an investigation by official public protector Thuli Madonsela. The acrimony over “Nkandlagate” has intensified in recent weeks as ministers went to court in an attempt to block the release of her report, while newspapers published photos of the home in defiance of a government warning that this might break security laws. Villagers’ huts in front of security fencing surrounding Jacob Zuma’s Nkandla home. Photograph: Rogan Ward/ReutersThen came Friday’s Mail & Guardian with a front-page cartoon depicting Zuma floating on a swimming pool full of cash. The paper published details of Madonsela’s provisional report, saying she found that Zuma had derived “substantial” personal gain from the security upgrade at “enormous cost” to the taxpayer, and that he must repay the state. Officials have repeatedly sought to justify the millions spent on Nkandla, insisting it was essential to provide Zuma with security befitting a head of state. But according to Madonsela, the improvements included a visitors’ centre, amphitheatre, cattle enclosure, marquee area, extensive paving, new houses for relocated relatives and a swimming pool – referred to in official documents as a “fire pool” on the pretext it could double up as a water reservoir for firefighting purposes. The Mail & Guardian estimated that these facilities added up to 20m rand (£1.2m) of taxpayers’ money – a striking revelation in a country where the average black-headed household earns 5,051 rand (£302) a month. In what “may be Zuma’s greatest embarrassment since taking office”, the paper added, Madonsela recommends that parliament call him to account for violating the executive ethics code on two counts: failing to protect state resources, and misleading parliament for suggesting he and his family had paid for all structures unrelated to security. The report also said Zuma ordered that his private architect be drafted in as “principal agent” to oversee the upgrade, even though he was not a security expert. This led to an “uncontrolled creep” of the project and eightfold increase in the cost, with elements such as an underground bunker going way over budget. The 215m rand spent on Zuma’s home is in stark contrast to state money spent on improving the security of previous presidents, the Mail and Guardian said. FW de Klerk, South Africa‘s last white president, who left office in 1994, received 236,000 rand (£14,179) for upgrades to his house, while 32m rand (£1.9m) was spent on Nelson Mandela’s home. The opposition Democratic Alliance said the provisional findings contained in the report “are so damning that, if accurate, they would warrant the most severe sanction of president Jacob Zuma’s conduct“. Thabo Leshilo, a spokesman for Agang SA, said the facilities “were purely intended to ensure the president and his family can live in the lap of luxury at taxpayers’ expense”. Zuma’s political career has been littered with scandals. More than 700 corruption, fraud, money-laundering and racketeering charges against him were dropped shortly before his election in 2009. The following year he fathered a child out of wedlock. But the Nkandlagate saga has particular resonance in a nation whose elite are often accused of betraying the principles of the liberation struggle and showing disregard for the poor. It could also define his presidency just six months before a national election. On Friday Madonsela condemned the leaking of her draft report as unlawful. She is yet to give the interested and affected parties, including Zuma, a right to reply, which may affect her final findings.